Afghans and security forces inspect damage to a bus after a suicide attack in Jalalabad east of Kabul, April 11, 2016. A Taliban suicide bomber on Monday struck a bus of army recruits in eastern Afghanistan, killing at least 12 and wounding 38 others, officials said. The violence happened near Jalalabad, the capital of Nangarhar province, which borders Pakistan. The Afghan defense ministry confirmed the victims were army recruits. It said the bomber rammed his explosives-packed three wheeler, or rickshaw, into a bus traveling to Kabul from Jalalabad. A Taliban spokesman, Zabihullah Mujahid, claimed responsibility for the attack. Earlier Monday, officials in Kabul said a “magnetic bomb” attached to a bus went off in the capital, killing two people and wounding several others. 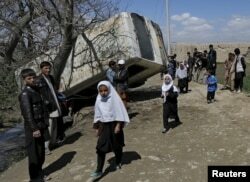 The victims were employees of the Afghan education ministry traveling to work. No one claimed responsibility for the attack. Schoolgirls walk past a damaged mini-bus after it was hit by a bomb blast in the Bagrami district of Kabul, Afghanistan April 11, 2016. The U.S. Embassy Monday warned Americans to stay away from a hotel in Kabul, saying it had received information that insurgents are planning to attack the building. “In response to this potential threat, the U.S. Embassy Kabul is advising American citizens to avoid the Star Hotel, and to remain vigilant when visiting hotels in Kabul, especially during large gatherings,” it said.